I am hearing for the past half an hour, a small girl crying 'please pa, please pa...' from an apartment at the back of our house. Both of us, I and my husband, are feeling restless and feel like going and telling the parents of the girl not to punish her like this...the girl is left at their balcony and the door is closed. She must be around 7 or 8 years old. I don't hear anyother child's sound in their house. The girl must be bored and so, must have done something to seek attention. Another next door neighbour's children are playing the whole day from morning to night. Their relative's children must have come and sometimes they fight with each other and the elders shout back at them. We just laugh and enjoy the sound because our house was like this when my children were small, during the school holidays! 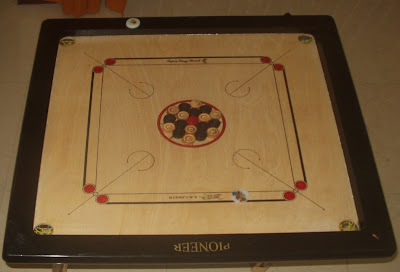 My children used to play carrom the whole day and we too were joining them and then cards! Sometimes scrabble! Yes, my nieces used to come and stay with us during most of the holidays. I used to cook the whole day. Take them for a movie, which was a must during the holidays. One day to the beach, here in Chennai! Then go to other relatives' houses together and enjoy! My main job was cooking...paav bhaaji, paani poori (I used to make even the poories at home! ), samosas, different types of parathas, cakes, ice creams etc. God, they used to eat so much! When we were in Hosur, we used to have cricket matches in our colony playgrounds, during holidays, between teams from other colonies. Elders' match and youngsters' match! It was fun! My younger son was always in the playground...I had to search for him in three playgrounds inside our colony after 6.30 p.m., most of the days! I had to push my elder son out to play! Contrast! Even if he played, it was not an active game. One day, he came from school and said that he played football match in his school. My husband asked him 'in which place'...he said 'I was a Goalie'! My husband started laughing! Our current Goalie (cat) was like him when she was small! Other kittens used to play actively when she was a kitten and this one used to watch them, lazily! So, she was named 'Goalie'! When the children were in school, I used to take them to Udupi, to my native place, during annual holidays. Unlike now, they used to love going to the Krishna temple, pull the temple car etc. and enjoyed doing it! One of my aunt lived in a village and so the children enjoyed roaming the fields, admiring the vegetable garden etc. Once they grew up i.e. when they reached 15-16, they started feeling bored with all these routines. They started sitting with a book or sometimes go out to friends' houses. Well, they were reading books earlier too, but slowly, the serious reading time went up! The next stage was dieting! They were refusing to eat oily foods...the outdoor games had nearly stopped. The younger son, esp. used to play in the school and outside too, until then. T.V. watching started consuming more time! They were not watching serials though...mostly cartoons or English movies...light movies. The serious movies came later! I see many of the parents send their children to some sort of summer camps now during holidays. During school days, they are sent to some tuition classes. Some lucky ones who enjoy games, are sent to table tennis or badminton classes. Otherwise, tuition, home work, TV...no other outdoor recreation. I feel sorry for them. Going to other relatives' houses are also becoming less and less. Everybody is busy. No time to entertain others' children. So the 'one child' homes mostly go out to some hill station or something for a week or so and the holidays are over. We can't blame them too. Now, my sons and most of the children in our family (nieces etc. ), are grown up and married...we miss those 'busy' days. Those days will never come again. So, enjoy the company of children as much as possible! We can also remember those happy days and they too will never forget them when they grow older! Very Nice Article. Congrats. Thanks for sharing. well said....timely article Sandya...Nithila on vacation! VAI GOPALAKRISHNAN: You must be knowing it too! Like us, you too must be remembering the good old active days! ASHOK: Nithila must be enjoying her vacation thoroughly, I know! Enjoy every moment. These times will not come back. This is the reason grand parents pamper their grand children, because they did not have time/mood, to enjoy the company of their own children. Yes, Madam. I still remember those golden days. In this connection I have written an article also with title as "மீண்டும் பள்ளிக்குப் போகலாம்” Part 1 to 7 and Par-8 as BONUS with Title as "இடிக்குக்கு இன்பச்சுற்றுலா”. These articles were well appreciated by so many readers with their very beautiful & sincere Comments. If you find time, you may just go though & you will definitely enjoy like anything. If you do not have time now, you may ATLEAST just go through THE PICTURES SHOW IN PART-4 ALONE. My "பொக்கிஷம் பகுதி-10” is released today. Just for your information, please. Holidays were so much enjoyed those days. My children never went to any summer classes/ camps, they just enjoyed relaxing at home. After school, exams and all the tension associated with it, they looked forward to just doing nothing, getting up late, and sleeping late, doing things they liked in the house. I don't understand why people make their children join all these camps, why can't they let their children be free from stress at least during holidays. The reason behind the name 'Golie' is quite interesting. I too was not very active in sports and I was a defender in football. I would rather like the ball to come to me, rather than taking it and putting it in the opposite goal! But I was (sort of) an all-rounder in cricket (due to lack of people!!). I hope parents don't burden young kids with all kind of activities. What ever classes we joined were our own initiative and we left them if we didn't like it. I guess both the parents working (these days) is creating such extra work for kids. VAI GOPALAKRISHNAN: Will sure read it! Thank you, Gopalakrishnan Sir! RAMA: Yes, children who enjoyed their holidays at home are lucky. But as Rajesh says, when both parents are working it would be difficult to entertain children at home. This will happen in our children's families too! DESTINATION INFINITY: "I would rather like the ball to come to me..." my son also must have been like that! He was a book worm always! Yes, both the parents have to work nowadays and they have to store their leave for emergencies...the children will have all the luxuries, but enjoyment is less, I feel. But it is going to be like this in the future. Those were the days we thought they would never end. It is a brilliant post. One thing that touched me was the crying child locked out in balcony as punishment.There must be better ways of disciplining the child. The final song by big B was like icing on a sweet cake of a post. I have onlly one grouse.You write once a blue moon. SG: Yes and we should remember that when we have small children, we should be patient with them...one day we should not regret about not spending time with them. K.PARTHASARATHY: Normally, the children cry for their mother, but this girl was asking for her father. Actually, her mother was shouting from inside. If I was living in the same building and if I was able to talk to her from my place, I would have done so. It is a big complex. I have to go to the next road to enter their flats. The sad thing is their neighbours didn't bother! Thanks for the compliment, Partha Sir! You made my day! That was so nostalgic, Sandhya! I alsmost visualized my mother writing all of this, so many accounts of your times spent with your children were similar to the ones my parents had with me and my brother :). I used to look forward to the holidays and our vacations to Kerala so much! Those were truly some of the most memorable days of my childhood. BHAGYASHREE: Feel very sorry for the children and the parents. They are not enjoying the young children's company. But nowadays, one salary is not enough for running a family comfortably. DEEPS: Yes, the leisurely times are gone now. Even if the mother is at home, children are more addicted to TV and computer than playing even indoor games with other children or parents. Only the parents can change it, I know, to some extent. BK CHOWLA: Yes, partly. My niece balances work and home very well. Since she has got 5 days work a week, she spends one day for house work and on Sunday, the parents spend time with their son and his friends too who come to join him. We must have the mindset to do that. Next week end their son goes to his friends' house. So, the children are not neglected at all. Even during holidays, the parents take turns and entertain their children. This is in the UK! But for this, lot of patience should be there...give and take should be there. We should not find fault with other parents...we just have to see that our children are not bored or left alone. Your post reminds me of my own childhood, how we met our cousins and spent days with them! RADHA: It is good to know that you are from Udupi! I speak Tulu! Very rarely we play carrom and scrabble nowadays. I play word games in my computer now! Those days are gone! SHAIL: I wanted to write about it long back. You can see baby Goalie in the kittens' link! She sits or sleeps while the other two kittens play. She was sleeping most of the time even when they fell on her! But she started new antics first like coming out of the box or climbing the bed. Then go to sleep! It was fun watching them! Yes, I am happy to know that this post reminded you of your younger days! They are precious! AVADA KEDAVRA: Yes, they do it often. We get tensed up on hearing her calling for her dad. Yes, most of the kids go for camps nowadays. Even the mothers who are at home are reluctant to take care of them during daytime. People are losing patience easily. Too much distractions. I am happy to know that you have happy memories of your childhood. Me too! We used to play games with small stones, pallanguzhi (a very old game), daaya kattam, etc. for hours together. My mother used to play with us for hours together. @ Sandhya - Konkani ! I too remember my holidays.. miss those days.. i feel sad that my son cannot enjoy those luxuries.. we used to sleep under those starry skies during the summer.. and my mother makes those vazhaikai chips esp on these summer days.. now my son sleeps before my hubby arrives.. IT Jobs! :(( I do buy him champak, gokulam and magic pot but thats not what he wants.. Hope I can provide him something like what you have mentioned in your post..
RADHA: Good to know you, Radha! HEMA: Good to know that you enjoyed your holidays, Hema! If you have got any relatives, you go to each others' houses. Yes, we have to adjust a lot for that, I know. I did/do! When I was in Hosur, I lived in a colony. After some time some two three families came closer to me and then our children were sleeping over in their homes during Sat. Sun. and theirs in our house. Slowly the children and parents became friends. When we or they had to go to the native place or somewhere, we were leaving our children in their house and vice versa. Yes, the children were in 4 - 5th stds. The children also will start adjusting to live in others' houses. But it is not easy to get close friends. I was lucky. Here, in Chennai, my relatives send their children to our place and I enjoy mingling with them. Give and take should be there, though. Otherwise the children will never know to adjust if their routine is changed. Try it atleast after your son becomes a bit older. Now, allow him to play with your neighbours' children but you have to be lucky to have same aged children. Colony is best to bring up children. SAI CHARAN: Thank you, for such a nice long comment, Sai! The children were playing chess too with their father. He is good at it! My husband used to teach his nieces when they were small, additions, subtractions, multiplications etc. to use shortcut methods...they follow them even now. They used to say, 'maamaa, kanakka...apram! ', but they joined the game after grumbling a bit! My children also are good at maths...to calculate long digits mentally without using even notebooks, thanks to their father. More usage of calculators came later. We had a lot of spare time, may be, because TV distraction was less! Waiting to read your summer holidays' experiences soon, Sai! R.RAMESH: Thank you, Ramesh! I am doing fine! Your family is there with you now, so you must be enjoying life over there! Be happy always! Sad but true, that these days, children don't seem to have that sort of fun anymore. They seem more than happy (their parents too, sometimes!) to leave the open outdoors, the mingling, the sharing, the fighting , and stay glued indoors, to either the TV or the computer. Of course there are still many parents who think and do differently, but too few! hey follow me on my blog too!!! Wow, what a post! I still remember the touch and feel of the scrabble board and the alphabets. We also used to play 'pallankuzhi' with tamarind seeds and not to forget, 'Goli', those green marbles. And yes, counries and capitals, word games, etc... the list is endless. Am quite proud to say that my son isn't addicted to TV or gadgets. Rather he chooses to spend his time with books, learning the tamil script, skating, playing outdoors and chess. And this is just because of 1 poem that I explained to him - Odi vilaiyaadu paappa - Bharathiyaar kavithai :). There are so many ways to keep children engaged nowadays. The onus is on the parents to bring up their children responsibly. USHA PISHARODY: Good to know that this post reminded of your and your kids' holidays! We and our children never forget those happy days, I am sure. Yes, some mothers still entertain other children in their homes and send their children to others' homes, during holidays, which is more fun, I feel. It is not good children growing up sleeping in their separate rooms throughout the year. They should know to share things with others. Next week my niece is coming with her two small children, to stay with us. It would be hectic for me because the fast life is over for me, since my children are grown ups now. Still, it should be fun being active once again! It might help when I have my own grand children later on! DIVYA SAWHNEY: Welcome here, Divya! I would be happy if you read the post and comment! Thank you! MALINI: I am happy to know that you too were playing pallanguzhi, scrabble and other games! Daaya kattam?! I have taught my children to play goli and bambaram too! I was good in those games! Bharatiyar paattu is a very good one! I taught Tamil to my children at home. Though like everyone, they are comfortable with English, they know their language to some extent. I have got many Sujatha's Tamil books. I am worried who will read those books after me! Nobody reads Tamil books now! Nobody talks good Tamil too! No other language is suffering so badly, I think. Thanks for the nice comment, Malini!